In the early ’60s, in the years of DC, Italian politics was judged incomprehensible by then-American Secretary of State Henry Kissinger. Things have not changed much. Why are Italian politics so opaque for voters? Because, in a democracy, transparency and the comprehensibility of politics is inversely proportional to the number of factions present in the game. Having carefully considered the subject of the above discourses, and wondering within myself whether the present times were propitious to a new prince, and whether there were elements that would give an opportunity to a wise and virtuous one to introduce a new order of things which would do honour to him and good to the people of this country, it appears to me that so many things concur to favour a new prince that I never knew a time more fit than the present. What was true in 1513 and 1989 still rings true today. It is clearly time for a new prince, and how this unfolds will be interesting. What it will change, of course, remains to be seen, though — in many ways I feel that Berlusconi has become a sort of bugbear for the left (as evidenced by films like Videocracy, which is not bad in and of itself but which seems to ascribe far more sinister powers to the prime minister’s lowbrow TV shows). Will Fini as PM wake Italy up? He does at least boast a book and a think tank to his name — as well as, of course, the oft-cited fascist roots. We shall see. 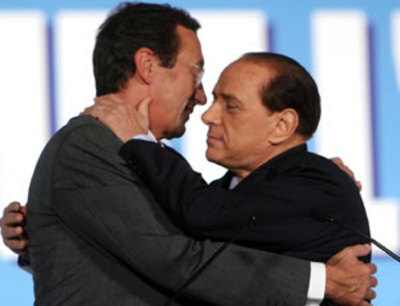 This entry was posted in electoral crisis, fini, il cav and tagged berlusconi, fini, machiavelli, political crisis. Bookmark the permalink.